If you're serious about sound, but aren't willing to compromise on style, Sanus Steel Foundation® speaker stands were made for you! Combining form and function, this handsome center channel stand has a contoured 10-gauge steel base plate with two 2" diameter pillars solidly supporting a steel top plate. Both pillars and top plate feature a handsome black powder-coated finish. But this stand isn't just about good looks. The base plate's stable platform minimizes energy loss from your speaker, giving you better performance. The rounded pillars minimize diffraction, and can be filled with shot or sand for added mass. A resonance-damping ring placed between the top plate and the pillars further improves the speaker's sound. The top plate is equipped with adjustable speaker isolation studs and neoprene isolation pads to dampen unwanted vibrations. You also get Sanus' Foundation Mount® system, for securing a speaker with a threaded insert firmly to the top plate. top plate measures 8" x 14"
base plate measures 11-3/4" x 14-3/4"
Well made and excellent fit , finish and stability. Sharp looking as well. 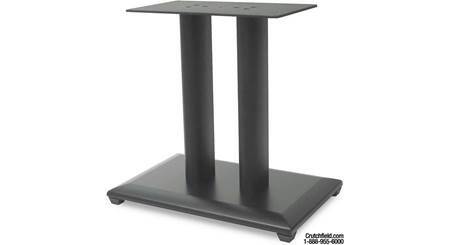 Compatibility: The Sanus Steel Series SFC18 is an 18" stand for center-channel speakers up to 35 lbs. The 14" (w) x 8" (d) top-plate offers adjustable brass studs for center channel speaker alignment. Steel Construction: The Sanus Steel Series SFC18 features heavy-duty 10-gauge steel construction. 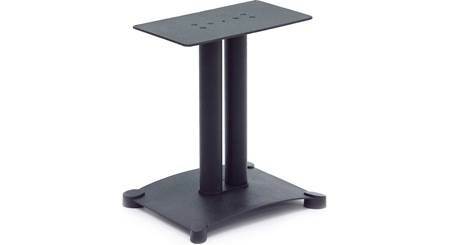 The extra-large steel base provides superior stability on practically any surface. The twin heavy-gauge steel pillars can be filled with sand or shot for added mass. Resonance Damping Rings: The top plate and twin pillars are separated by self-adhesive cork resonance damping rings. This eliminates speaker resonance from passing through the stand causing distortion. Wire Management: The steel pillars feature a concealed wire path to hide your speaker wire for a clean and neat installation. The stand is also equipped with plastic guides at the bottom and top to keep your speaker wire neatly organized. 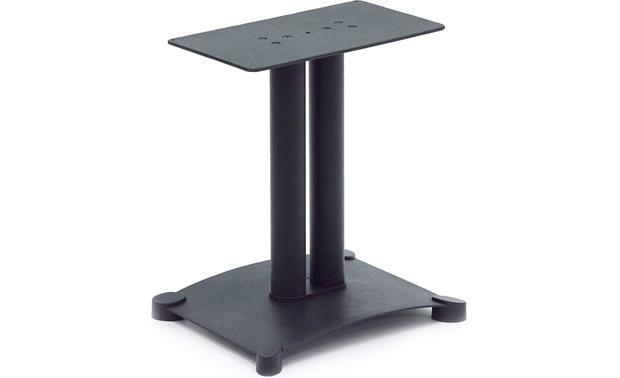 Rubber Pads or Spikes: The stand features plastic feet and has threaded inserts on the bottom that allow you to use the included isolation spikes or rubber feet. The isolation spikes are adjustable and designed for carpeted floors. The rubber pads are safe for hardwood, tile, laminate, and vinyl flooring. The spikes add 1" to the overall height of the speaker stand. The rubber pads add 0.25" to the overall height of the speaker stand. 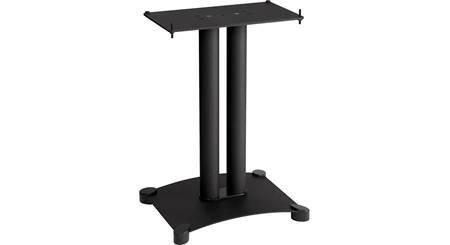 Steel Foundations® series  18"
Searches related to the Sanus SFC18 Center Channel Speaker Stand Steel Foundations® series  18".